A Rock Star of Scientists – Making sense of an interconnected world. Together. He was sighted first stepping out of a yellow cab. The AP Coordinator spotted him first. “A man – maybe it’s him – is coming up on the Rumble side.” Three of us rushed to the side door, opening it to discover the man we had been waiting for. With excitement. For 7 days. Add to that an extreme nervous anxiety. So he was finally here. Three of us awkwardly waved him towards the uncelebratory, non-descript, blue double fire-exit door of the A-wing. He shook each of our hands as we introduced ourselves. This was Dr. Andrew Fire. He shared the Nobel Prize in 2006 for the discovery of a mechanism in cells that would shut down the expression genes, providing an early hope that one day a gene for disease in humans, animals and plants could be silenced. What is a Nobel Prize Winner like? In our minds, this man was a genius. Chosen from the entire world of scientists for a lifetime of work. We felt so lucky to have this academic rock star in-person at our suburban high school. Wow. It was hard to know what to expect. Except that within the very short time he had forewarned us he would be coming, we had built him up to mythical status. So what was he really like? He spoke quietly. He listened intently. He was gracious. And so easy-going. He expressed sincere interest in touring the school with a science student. He drank water. Dr. Fire is a real person. When arranging his visit, he gently persisted that a theatre was not going to work for him; he had spent his life teaching and he preferred a classroom setting. There would be no computer or PowerPoint, he wrote, “I promise”. Instead, Dr. Fire engaged a semi-circle of Burnaby science students and staff with a problem, a scenario that turned out to be the exact one that had set him on the path to his Nobel Prize. How to get rid of nematode worms from California strawberry fields before the pests damaged the plants. Through interactive questioning, he drew the audience into critical thinking-mode and together worked through this real problem. Each time the students thought they were closer to a solution, Dr. Fire would introduce new set of obstacles and realities to deal with. If the plants look mangy and yellow, then what might be wrong? What could we do with a bunch of worms but no money? What if people don’t want lethal chemical residue on their strawberries, or harmful pollutants ruining the ozone? If a cell works ‘in this way’, then how can we use an “anti-sense” that works ‘in this way’? And so on. The process was brilliant and every single person in the room was following. Dr. Fire was collaborating and connecting with every mind in the room, taking us through the very special, real and legitimate process of a scientist. He was demonstrating what seemed like an internalized belief that science is the work of many minds. During his Nobel Lecture (where he had actually used a PowerPoint) he presented a slide with hundreds of names. He was thanking all of the people named there for their contributions to the discovery for which he and a fellow scientist had been awarded the Nobel Prize. Dr. Fire acted then and now like a true star, one with great knowledge and wisdom, willing to share the power of that knowledge. Dr. Fire went on to explain his work with cell genetics. And he concluded with an incredibly important thought. He said that with the acceptance of a Nobel Prize comes incredible responsibility. He emphasized that one must speak out and educate the world about the significance of the work behind that Prize. In this case, the discovery of gene splicing or RNA interference (RNAi) has not lead to the eradication of human disease quite yet; cells of animals and humans are very complex. But there is great potential and evidence of success with the use of RNAi in plants, leading to the production of more food. Strawberries are a luxury crop, but Dr. Fire suggested that we can work on methods to improve the world’s most significant food crops, ensuring that millions of people do not go hungry. The Food and Agriculture Organization (FAO) of the United Nations agrees. Dr. Fire has consulted with them. The 90 minutes ended in what seemed like 10. 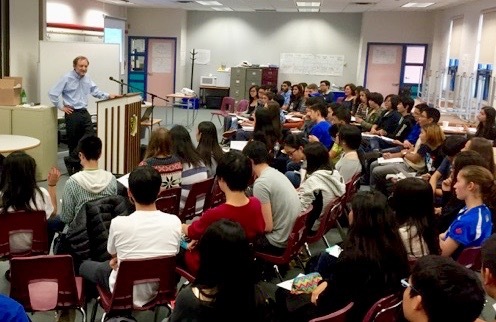 Our new friend, the Nobel Prize recipient Dr. Andrew Fire, left Burnaby South Secondary School flanked by 10 Burnaby student leaders. Together they walked two blocks north to the Skytrain station where students instructed Dr. Fire how to validate his pass and at which station to disembark to get to his next engagement. Dr. Fire would return to Stanford University by plane the next morning having left this a small part of the world a better place. Wow. Sometimes amongst all of the description there is one word that says it all.